Parking options & fees at Orange County Airport include: Parking Garages A1, A2, B2 & C (the first 15 mins are free for passenger dropoff/ pickpup) - all garages offer curbside valet parking. All parking options offer short- and long-term parking. Each parking garage indicates level, available spaces, and disabled parking. NOTE: Parking structures A1, A2, B2 & C fill up quickly at midweek. You have the option of using curbside valet parking or use the Main Street Parking ot offering free shuttle service to the Riley Terminal. Valet parking on the upper Departure Level in front of the Riley Terminal, with two dropoff curbside locations - one between Terminals A & B, and one between Terminals B & C. On arrival, call 949-752-5558 or use the while courtesy phone dialing 2-4018 in the Riley Terminal. Fees: $10/hr up to daily max $30. 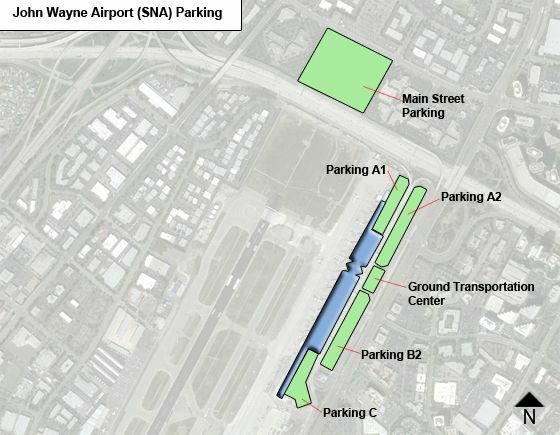 Garage parking: Garages B2 & BC are closest to Terminals B & C; while Garages A1 & A2 are next to & across from Terminal A. Garages A1, B2 & C offer 2-hr limited parking on their lower level, near the terminal entrance. Fees: each hr $2, up to daily max $20. Ecocomy Parking (an uncovered lot on off-Airport premises) located on 1512 Main Street in Irvine, 92614. Courtesy shuttles run every 15 mins and are lift-equipped. Shuttle pickup by blue buses (marked 'Main Street Lot') is available from the lower Arrivals level. Fees: $2 each hr, up to daily max $14. Payment options: Cash, Visa, MasterCard, Discover Card & AMEX, as well as debit cards with Visa or MasterCard logos. PARCS were installed in all parking facilities and offer two options - either use the paper ticket system or go ticketless by swiping credit card for parking access and using same credit card upon exiting using Express Exit Lanes. For more parking information call 949-252-5200. If you don't rememer where you parked call the Arport Police at 949-25-5000.